As the elevator door opens on the third floor, Chloe Iliff steps out and assists Rita Miller into the activity room. 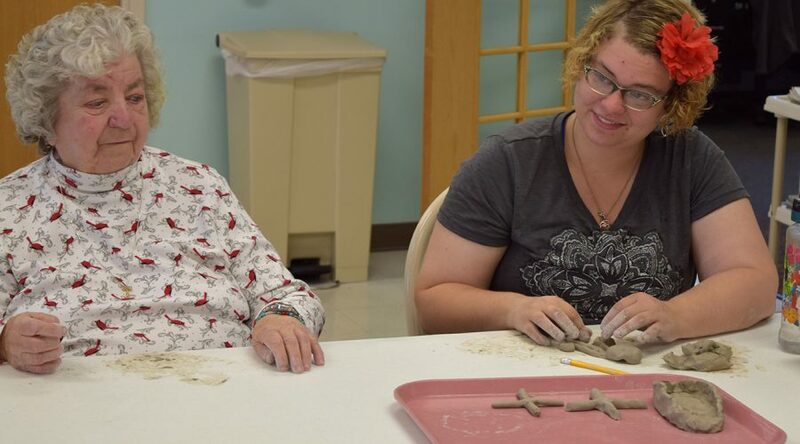 It’s around 10 a.m. on a Monday at Hillebrand Nursing and Rehabilitation Center in Cheviot, where each week, Iliff teaches pottery to the residents. She’s been volunteering at the center since spring, a gig she found with help from Ann Myres, integration specialist for Hamilton County Developmental Disabilities Services. Iliff has been making pottery for three years — working with clay is part of the family business – and was looking for a way to be more active in her community. Myres reached out to Hillebrand to make the connection and a few weeks later, Iliff started her class. “It’s something fun to do and I like visiting with them,” she said. Eloise Remar has also been coming to pottery class since it began and likes watching what other people create. For both Miller and Remar, who are roommates, working with the clay also helps with arthritis in their fingers. Ellen Peter, activities director at Hillebrand, said it’s been great to watch the residents be creative. “Chloe is wonderful, and she’s a big asset to us,” she said. After each session, Iliff collects the finished pieces on a tray and brings them home. Her family fires the creations in the kiln and glazes each one. When she returns to class, she’ll have the finished pieces for everyone. Chloe’s story originally appeared on our website July 17, 2017 as part of our series highlighting people we support giving back to their community. See more stories like this here.